4 states in one day! But we really didn’t drive many miles. I had never looked closely at the borders of these 4 states or noticed how they meet up around the confluence of the Mississippi and Ohio Rivers. It was a short 12-mile drive this morning from our motel in Charleston, Missouri, to the bridge across the Mississippi into Cairo, Illinois. Cairo is at the point of land formed by the “V” where the Ohio and Mississippi Rivers come together. So it was a brief 10 minutes in Illinois before we found ourselves crossing another bridge, this time over the Ohio River into Kentucky. In Wickliffe, Kentucky, a 95-foot cross sits on top of a bluff that overlooks the 2 rivers and has a view into the 3 states. The drive through Kentucky was a bit longer than the drive through Illinois, but not much. In about 30 minutes we crossed over the Kentucky/Tennessee border into Fulton, Tennessee. 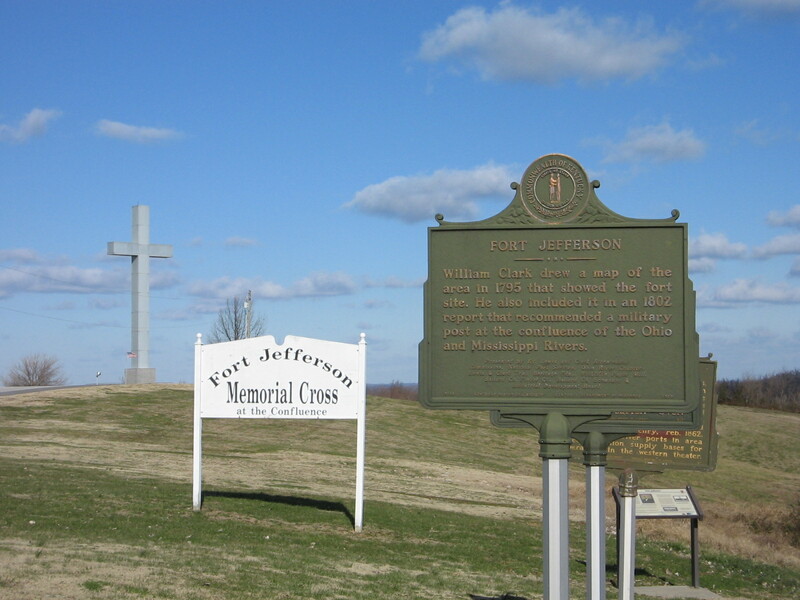 Our plan was to spend the night in Jackson, Tennessee, which was less than a 100 miles so we were in no big hurry. 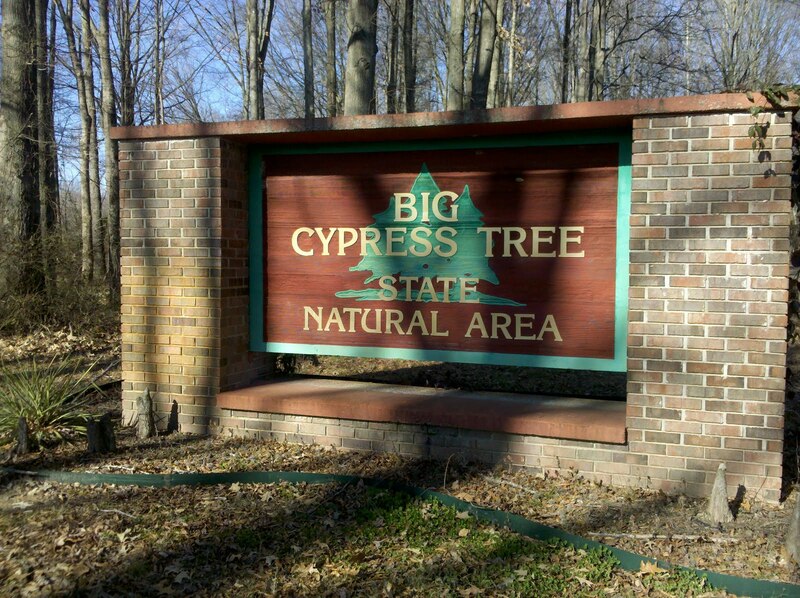 When it got to be close to lunch time we looked on the map to see if there was anything interesting nearby and noticed Big Cypress Tree State Park, not too far off the main road. We decided to check it out. Although the map showed it as a state park, it’s actually just a natural area and a small one at that. Since it was a holiday we weren’t even sure it would be open. But we just wanted a place to park the car and eat lunch so we drove in. It was too cold to get out of the car but nice sitting in the sun. There was only one other car in the parking lot and we observed a park ranger and a girl with him who was picking up trash. Soon the ranger came over to the car and handed us a park brochure. 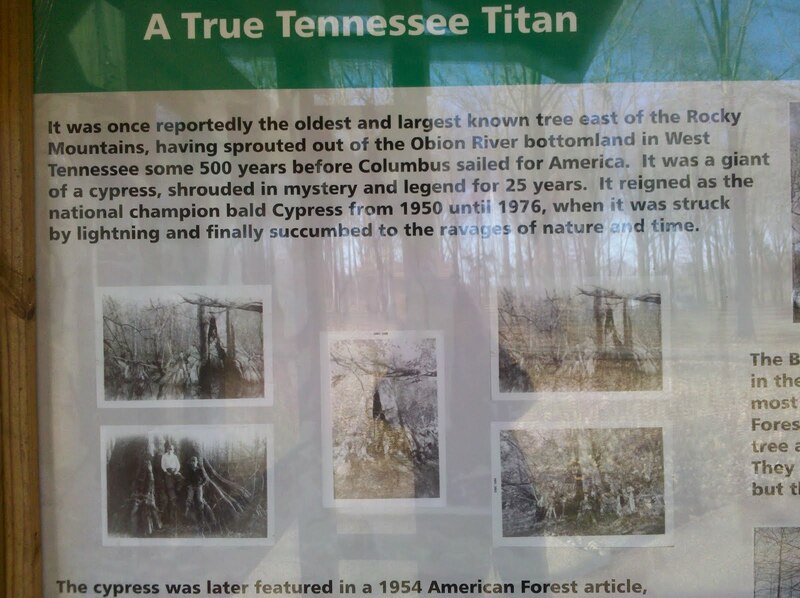 What a disappointment to read that the Big Cyprus Tree was no longer even there! But the ranger told us that in 30-minutes he would be leading a walk through the park and explaining its history and features. We decided to stick around. It turned out to be a very educational hour and a half, as well as an enjoyable time chatting with the ranger, his daughter and the other 2 people who came out for the walk. Tonight we are staying in Jackson, Tennessee, and will continue our journey through Tennessee tomorrow.